Warning the needles are very sharp. 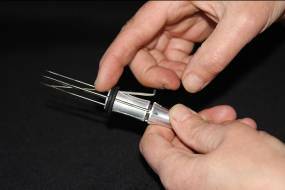 Always Have the holder pointing away from your body when inserting or removing needles. First support the holder in both hands with the slotted end away from your body. 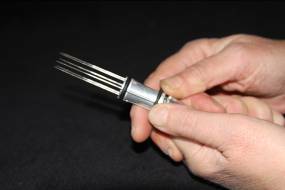 Use both thumbs to roll the middle “O ring” from its groove and slide the ring towards the head of the tool till it almost reaches the front “O ring”. Hold the needle by its head and slide the needle away from you under both rings. When the head of the needle lines up with the “O ring” groove rotate the head into the groove. Slide the “O ring” back into its groove covering the needle heads. 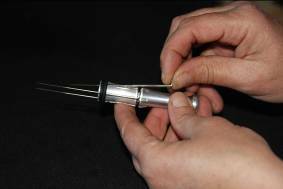 Roll the tool between your fingers to push needle heads into the bottom of the groove. Roll and slide centre “O ring” away from you as before, now apply light pressure to the needle towards the middle of the tool where the needle protrudes from the holder, this will lift the needle head from its groove allowing the needle to be withdrawn. Copyright © 2015 Snowycreek Engineering, Inc.